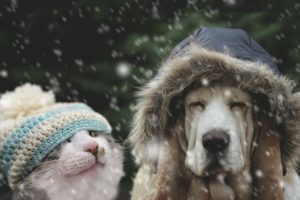 Snow and bitter cold will be sending shivers across our region during the upcoming week, and we urge all dog and cat owners to protect their pets from the freezing temperatures. Pets can suffer from frostbite and hypothermia just as humans can. If it feels cold to you, it’s probably cold to your indoor cat or dog. Here’s a list of ways to protect pets from hazards such as frostbite, as well as other hazards such as de-icers and highly toxic antifreeze. These tips will remain important next week, (even in areas where temperatures are expected to rise above freezing), paws that sink into slush can still feel mighty cold. The most common-sense tip is, don’t leave your pets in the cold for too long. Fur coats won’t protect them from prolonged exposure. Monitor your pets and bring them inside if they start to shiver or if you see redness in their tails or ears (which could be frostbite). Once inside, help them get the ice out from between their toes. If you spread a de-icer on your driveway or sidewalks, find one that’s pet-friendly. Various toxins and even salt can cause problems for pets, who tend to lick the substances off their paws. Don’t leave your pet alone in a car while you go into the store. It’s a bad idea in the cold. Cars can act as refrigerators that hold in the cold and cause animals to freeze to death. Pets sometimes spend more time in garages and basements in winter, so make sure to clear these spaces free of antifreeze and rat poison, both highly toxic. And remember, cats love to crawl into anything warm, including a nice cozy car engine. If Fluffy spends the night in the garage, make sure to locate her before starting the car. Winter can make it hard for pets to find their way back home because ice and snow mask familiar scents and paths. Keep pets on leashes so they don’t get confused and lost. Be sure your dogs and cats are wearing identification tags. And don’t forget to have your pets microchipped. Your dog will never tell you, “Oh, my arthritis acts up in the cold.” And yet, it does. If your pet struggles when getting up and moving around the house, make a trip to the veterinarian. Also, make sure your pets have soft, warm bedding. Consider getting your dog a sweater or coat, especially if they are short-haired. Remember, if it’s too cold for you, it’s probably too cold for your pet, so keep your animals inside. If pet insurance is on your priority list this month, call us today! Or visit any one of our six regional locations.